Towing, in sailing terms, can mean one of two things. Either you are towing someone (in which case you will usually be in a powerboat doing the rescue) or you are being towed. We’ll talk about both. Sometimes things don’t always go to plan – we’ve seen that already in our seamanship series, on the subjects of reefing afloat, Rudderless Sailing Pt 1, Rudderless Sailing Pt 2, and Sailing without a centreboard but to name a few. They all deal with scenarios where conditions are difficult, or you have had some, but not catastrophic, equipment failure, and can still carry on under your own power. Towing however, can be for more extreme situations. It may not always be though – it could simply be that on a training day, the wind has dropped completely and you need to tow your students in, or a race has been abandoned due to complete lack of wind and a friendly safety boat operator helps you back to the bar quicker. Towing is also used on a daily basis in large harbours and ports where small manoeuvrable tug boats tow in larger ships that can’t manoeuvre as well in confined spaces. We won’t be looking at those today. Unfortunately, on the flipside, the “failure” situations where you might need towing aren’t quite so simple. If you’re being rescued, then most likely you’ve had engine failure, your sails are ripped to shreds, your boat has been dismasted, you could be taking on water, or sailing conditions have gotten so extreme that it’s quicker and safer to be towed back to safety than to sail an upwind course to safety. We’ll look at both sides of towing – how to tow, and also how to be towed, which varies for each type of tow. Before we start, for sake of argument, we will assume that the boat being towed (rescued) is a sail boat (in our scenario, a small dinghy), and the towing (rescuing) boat is a small powerboat, generally between 10-20 feet in length. This covers most situations that you will come across in our sailing articles – a small to medium sized dinghy being rescued by a small powerboat. The alongside tow is usually used for short distances only. For an alongside tow, the power boat comes up alongside the boat to tow (which can be sail or power boat). They draw more or less level, although it is important to keep the towing powerboats engine behind both, as shown in the diagram. If it is for a really short distance (a few hundred metres at most), the powerboat crew and towed boats crew can between them hold the two boats together. This is only suitable for light conditions however. If it is something like a Pico, Topper or Laser being towed, you can pull the smaller dinghy down onto its side, and drop the mast and sail across the powerboat, and get the crew to sit on it – again, only suitable for short distances though. This is a common technique when assisting windsurfers too. The faster you go like this, the more water you have shooting up between the boats which can be inconvenient. For a longer distance alongside tow, you should secure the two boats together. To do this, you ideally need 4 lengths of rope – 2 warps, and 2 springs. 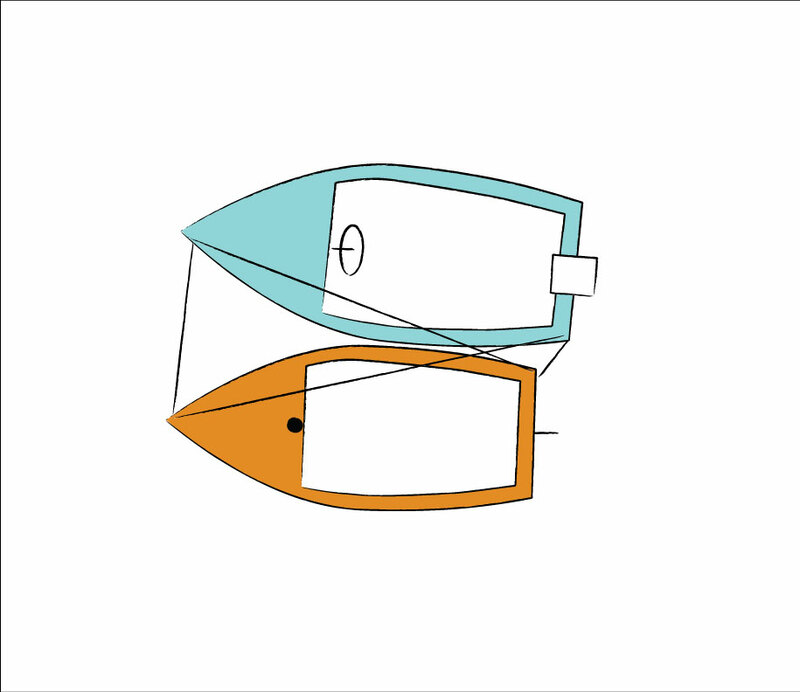 They are arranged as shown in diagram 1 below – a rope from the front of one boat to the front of the other boat, and the back of one boat to the back of the other. These lines keep the boats pulled close in side by side. Then, take another two ropes, one each from the front of one both to the back of the other, for both boats. These two lines stop either of the two boats moving forward or backward. Again, remember to keep the engine of the towing boat clear at the back, otherwise you won’t have enough manoeuvrability. One important point is that the lines should be easy to undo, or take a line around a cleat once and hold it – you need to be able to release the two boats in an emergency. If you are being towed in an alongside tow, then you should let all your sails out, or if you can, drop your sails. If you pull in your sails and put power on at any time, you’ll put strain on whatever is holding the two boats together, and risk damaging them, and make it harder for the towing boat to control the direction. For the same reason, you should attempt to steer in approximately the same direction as the towing boat (unless your rudder is broken). If you need to be towed for a longer distance, then you should consider the in line tow. In this scenario, the boat being rescued is towed behind the towing boat. A line can usually be taken from the back of the towing boat, either from a rope bridle behind the engine (being very careful not to snare it in the prop), or from a metal support that you can find on some boats, or a similar fitting. The rope is taken to the towing boat, where it should be taken around the mast, just a couple of turns, and the end held by a crew member. It should not be tied off, unless you are towing for very long distances (like say 500 miles that a yacht sailor towed his yacht to rescue it). Once again, you need to be able to release the rope quickly in an emergency to detach the two boats. How long should the rope be? It depends conditions; if you are sailing on a lake, then generally three to five boat lengths would probably be considered as the minimum; you need some distance between the boats so if the towing boat slows down, the towed boat doesn’t slam into the back of it. If you are sailing on the sea, then the length of the rope should be at least one wave period (peak and trough). As with the side by side tow, you should attempt to steer the boat being towed in the same general direction as the towing boat. You should also move your weight to the back of the boat; the stern of boats are generally flatter, so moving backwards will not only stabilise the boat balance, but also pull the bow out of the water, which usually being pointy, will hinder steering (similar theory to centreboard-less sailing but in reverse). 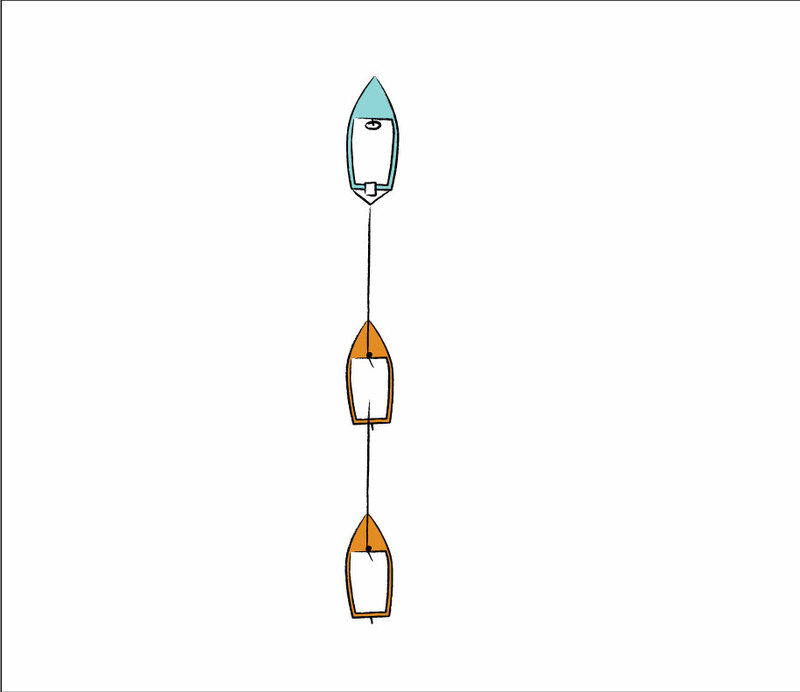 The multiple boat in line tow is fairly similar to the in line tow for one boat, but for multiple boats – for example if you have several student boats to tow to shore. There are several ways you can do this. For both ways, the first boat in the tow is towed the same as above in the single boat in line tow. For the additional boats, you can tow them all in line. The tow line for the second boat should be taken from a firm fixing point in the first boat being towed, for example around a thwart (seat), toe straps or other solid fixing – not the transoms – as it will be taking some amount of load. It should not be attached to a main sheet block or the boom as not only are these not solid but they also move. It should also not be attached to the mast, as if the boat being towed moves to either side, the tow rope will cut across the boat and could knock someone out or decapitate them (this doesn’t apply if the boat being towed is empty of course). The same technique can be used to secure any subsequent boats. The herringbone tone is one of the more difficult tows to setup, but one of the better ones for towing multiple boats over long distances. This is difficult to setup on water, for reasons you will shortly see. For a herringbone tow, the tow boat streams a long, strong rope behind it, with loops tied into it at regular intervals. Each boat in the tow is tied into one of these loops. Remembering from earlier that the boat being towed should be able to easily loose off the tow row, you can do these one of two ways – either take a line from the painter or the mast, through the loop, then back and looped around the mast, or tie a line on the loop, take it to the mast, loop it around and then hold the loose end. Additionally, each alternate boat should be on the opposite side of the rope, in a herringbone pattern. This is why this is a difficult tow to setup on water, as you have to take the powerboat past each boat in turn, on alternating sides, and they must pick up the loop to pass their rope through. In anything other than calm conditions, with a skilled powerboat driver, this can be quite challenging. So how do you setup a herringbone tow? The easiest way is if you have a pontoon with usable water on both sides. Set the towboat up at the end of the pontoon, with the rope streaming back along the pontoon. Set the boats to be towed up on either side of the pontoon, and secure them through the loops onto the tow line, as shown below. When all boats are secured, make sure there is no-one standing in the way, and the tow boat should slowly start to move away, taking up the slack, then slowly increase speed as the boats being towed move away. When you are being towed in a herringbone tow, as with the other towing methods, it’s best to be towed with your sails down. Sit back in the boat, and steer in the same direction as the tow boat. If you don’t steer, then all the boats will end up in a line one behind each other, instead of in an alternating herringbone formation. The final part of the herringbone tow is the release – even if you are towing boats from one land based location to another, at some point you will need to release. This is best done one at a time, with the boat at the back releasing first. A few seconds later, when there is some distance between boats, the next boat from the back releases, and so on, until all boats are released. Make sure there is plenty of space between the boats, especially if they need to put their sails up once released. 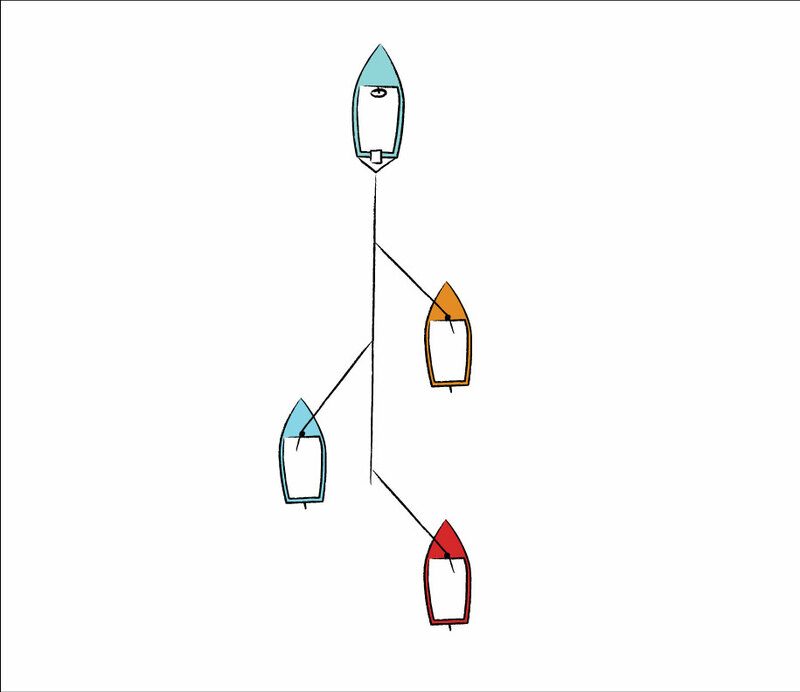 While we concentrated on examples using small dinghies and small powerboats, the techniques described above can apply to boats of varying sizes, including and up to yachts. However, once your boats start getting larger, the loads involved (on ropes and boats) start increasing, and if proper care and attention isn’t taken, it can be easy to break things. We’ve looked at a few examples of how you would be towed if you need to be in an emergency, but from this you should be able to get a good idea of the ways to tow people. If you’re interested in doing more of this, then we’d suggest you take a Level 2 Powerboat course, and after that, Level 3 Safety Boat course, as a lot of the syllabus of these two courses is geared towards teaching you how to tow boats.